Over three days and nights the Dallas Museum of Art along with SMU’s Division of Cinema-Television, the DALLAS Film Society, and Blackland Prairie Design paid tribute to a true film icon. Sir James was there for Thursday and Friday nights and PSD would like to share our experience with this directing legend. The film festival looked to highlight the years in which James and his long time producing partner Ismail Merchant both directed films. The duo, along with talented screenplay and novelist Ruth Prawer Jhabvala, have made award winning films for just shy of 50 years. Merchant Ivory is actually a collaboration of three remarkable people from three vastly different cultures: Ismail Merchant, the producer, born in India; Ruth Prawer Jhabvala, the screenwriter, born in Germany and educated in England; and James Ivory, the director, born in the United States. Dallas was place of something unique to this famous filmmaking group. James explains why that is and also talks about what exactly was going to take place over those three days of the film festival. James then talked about the vast difference in his and Ismail’s point of view. The event was held at the beautiful DMA where you can witness wonderful jazz fueled dining, intriguing and gripping art exhibits. 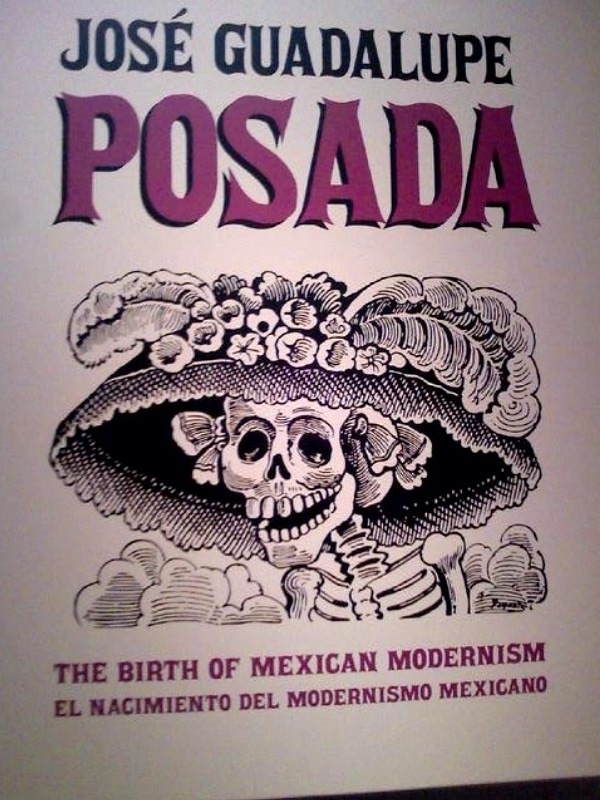 One of which is the México 200 José Guadalupe Posada: The Birth of Mexican Modernism. I really found an intriguing parallel in what James hinted at about why Merchant Ivory Productions was so successful. Drastic difference can be the greatest element in bringing something amazing to life. Just as Posada showcases his satirical nature of the Mexican political system in the mid-19th Century, Merchant Ivory showcases the true nature of numerous different families or groups. Their films point at the fact that no matter your level of wealth or status in society you share the fundamental emotions that give people their inner-drives. Posada made fun of the hypocrisy by giving them a costumed skeleton look. James and Ismail masked their characters instead with their clothing and then spent the life of the film showing us the real truth. Its no wonder that their films touch more then just an American, British, or Indian’s sensibilities. Rather it touches us all, if we realize the parallels are not skin color, family name or status but rather the emotions (love, hate, jealousy, and desire) that are our true distinguishing elements. 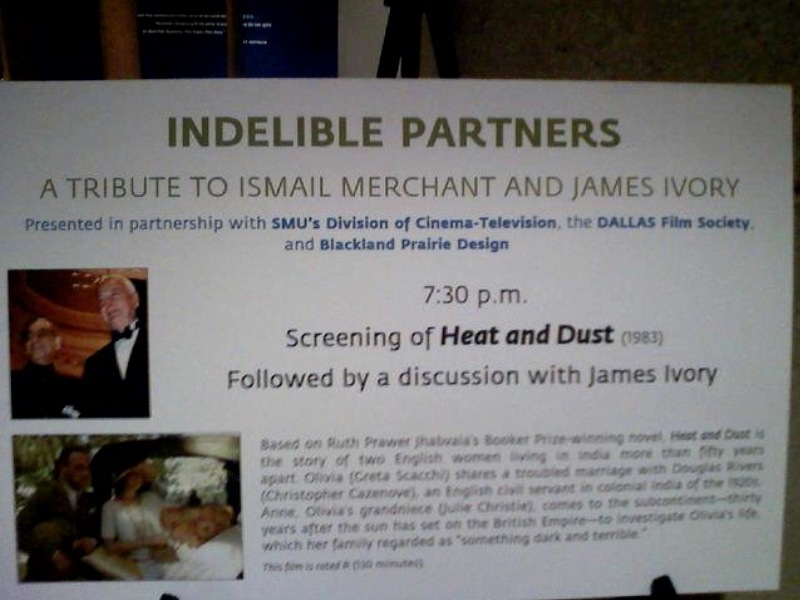 The film that opened the film festival, HEAT AND DUST, seems to fit perfectly this “image”. James talks about just why it does work for showing Merchant Ivory Productions. Immediately after the screening Sean Griffin, Chair and Associate Professor of SMU’s Cinema-TV, held a loose Q & A with Mr. Ivory. 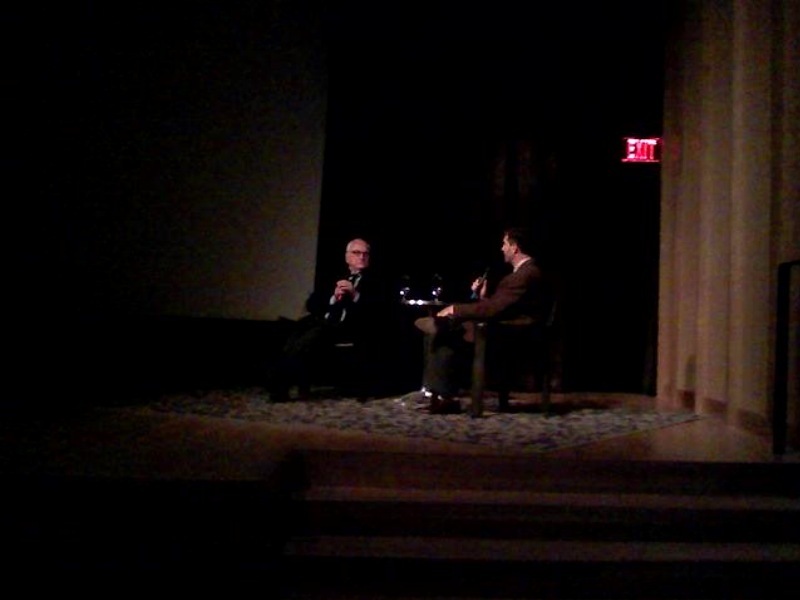 James talks about how the film, HEAT AND DUST, came to be made at Merchant Ivory Productions. The beautiful Greta Scacchi plays Olivia the beautiful young wife of the Assistant Collector Douglas Rivers in the 1920’s portions of the film. James talks about how Julie Christie came to be Anne in the film. James talks about how raw he was as director dealing with the challenges of making a period piece. James discussed about some of the wonderful “finds” the cast and crew just came across during the shoot. The length of the shoot and in particular the time of year was discussed. James talks about just how important Ismail’s presence was for their films. Check back tomorrow as we’ll let James tell you about the other amazing films he’s directed and he’ll cover the films showcased in the 3 day festival. Also James was kind enough to tell us what he has planned next and he gave me a real special treat of what Shakespearean role we’ll see Sir Anthony Hopkins in next!!! You did a good job of summarizing the movies, history, overview and how you tied it to the Mexican art at DMA. Bravo!